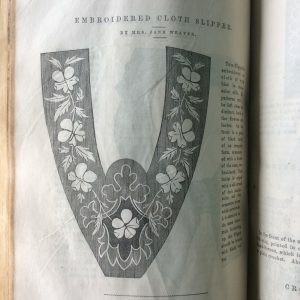 I had been unsuccessfully wracking my brain for a brilliant first “Shop Talk” topic, when an observant Instagram follower spied a set of antique slipper patterns in the background of a recent photo. 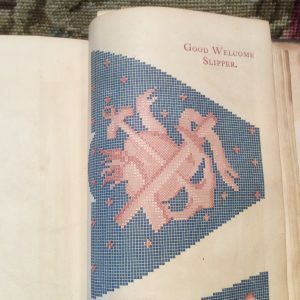 Between their eye-catching look and interesting history, I knew the slippers were a perfect place to begin. My shop is like an open door collection – stuff wanders in, and stuff wanders out. I love it all, and especially enjoy when visitors take the time to look around and ask questions or share experiences. 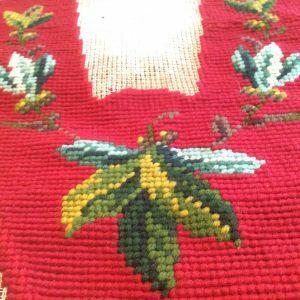 I have dealt in antique textiles for a long time, yet I continue to learn from my customers and followers. Welcome to my world: I know a little bit about a lot of different things, but I am an expert in none. 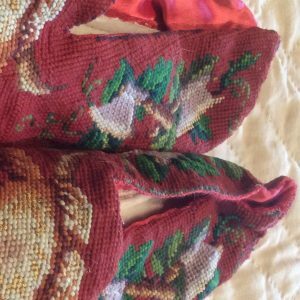 This particular pair of colorful Victorian house slippers are worked in wool on canvas. 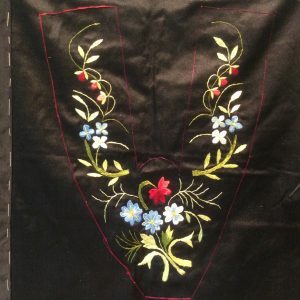 Patterns were available in popular women’s magazines such as Godey’s and Peterson’s, and the reader could work within her skillset, embroidering or stitching the tops. These finished tops were often sent out to cobblers, who stitched on the bottoms. The shop pair has machine stitched bottoms. 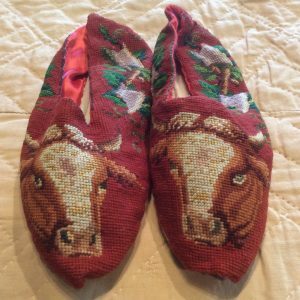 I have had this late 19th century pair for a couple of years now, yet only recently drew my eyes away from the commanding stare of the steers to notice the crossed axes on the sides. Hmmm… I picture a young lady making these for her suitor or papa, and am left wondering if perhaps the fellow was a butcher. It is not uncommon to find unfinished tops, which were never cut apart and made into slippers. 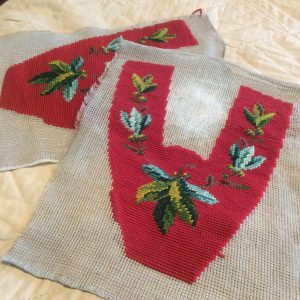 I have two such examples in the shop right now; the first pair was also worked in wool, showing its canvas base, and the second was embroidered in silk on silk satin. In a perfect world, we would all have time to make beautiful slippers for ourselves. For now, it’s enough to appreciate the work of others long gone, and to be thankful for the lease loving guardians who took care of their work.